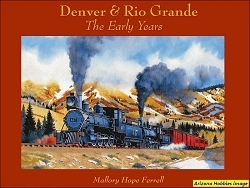 This pictorial contains photographs of the various equipment listed in the sub-title for the Rio Grande narrow gauge lines. 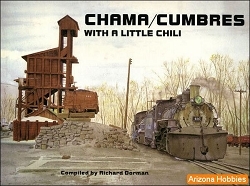 This book completes the freight car series begun in Volume 3. 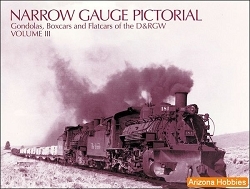 Drawings for the 30 ft. and 40 ft. reefers, 30 ft. and 34 ft. stock cars, and two types of tank cars are included to provide details and dimensions for modelers and historians. While this Volume is not an exhaustive study of these cars it does contain photographs of their major lettering and detail variations. Also included is a reprint of an article from a 1925 railroad trade magazine that describes the construction details of the D&RGW 40 ft. reefers. The large-format photographs are great for modelers! Roster of Equipment and UTLX Numbering Chart, pg. 176. R/Robb Ltd, softcover, 176 pages, 11 x 8.5 x .5 in., large-format B&W photographs with captions.